After the relaxing wind down of the three day boat trip up the Niger River to Mopti, it was back to the journey. With a mornings tlc and attention, the bike was ready. I was so impressed with its performance and durability after the hammering it got on that road to Timbuktu. My remaining mirror had been broken, which was repaired and remounted; I changed the tyres again to the Conti Escapes, more suitable for the tarmac; all bolts were checked and tightened; the oil reservoir had a mounting sheared which I temporarily stabilised; the headlight bracket had shaken off its mounting but was simple enough to replace; and that was about it. Until, after farewelling Sean the Aussie fellow biker who was intending to tour around Mali a little more, the bike’s temperature warning light come on a few miles down the road. Off came the spare tyres and dry bag, out came the tool kit, and then the side panel and side auxiliary fuel tank were removed. The radiator was dry! The day before leaving Ireland, I’d discovered a leak in the radiator. Pressed for time, I had decided to throw some Radweld in, hoping that would solve it – knowing of course it was only a temporary solution. Unfortunately these things come back to bite you. The solution that had held up to then, with a ‘plug’ effect, must have got shaken off. Hmmm. Well, miles from the nearest workshop, I chucked some more of the wonder solution in hoping it would keep me going a little further, and luckily it seemed to do the trick. Making sure I had extra water in the eventuality, I was a little anxious the rest of that day, and to a lesser and lesser extent the following days waiting for the overheating warning light to come on. It didn’t. With the odd top up now and again it held. 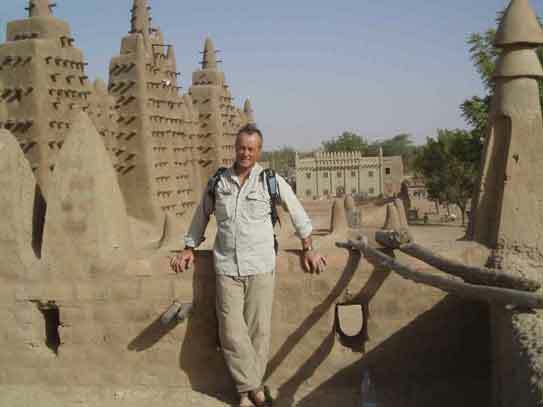 I spent the following evening in Djenné, whose Grande Mosquée adorns many a West Africa guide book and Mali post card. 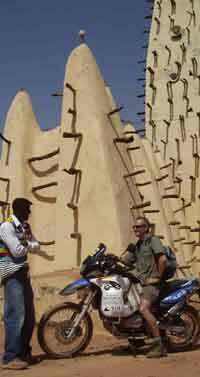 And this was one of the attractions for me in Mali. It is the largest earth built structure in the world. Sticking out of the building are wooden posts, like porcupine quills. These act as scaffolding. 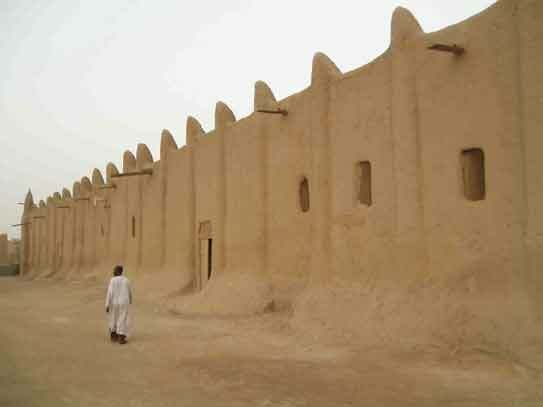 Each year, the mud render is plastered over the mosque to protect it from the heavy rains. (My guide told me later there was a big protest in the town as the Saudi government was proposing to help conserve the strucure by cementing it! At first I thought my French was letting me down, but yes, that was the story.) And the town itself is pleasing. Apart from the mosque, there are no other attractions of particular note, just the lovely atmosphere of the narrow alleys and streets of mud built walls. It was getting on a bit in the afternoon when I set off with my guide, Abdramane. He was one of a few lads lounging around the courtyard of Chez Baba, the hostel I’d checked into, and my initial impression was of someone fairly quiet though confident, a slight reserve about him. It turned out he was quite a devout Muslim, as many in the town are. There are a number of Koranic schools here, and students travel from around the country to attend. I don’t have the same reaction to the use of a guide as many ‘independent travellers’, who tend to avoid them, seeing them as an unecceassary extravagance, a convenience for the benefit of ‘tourists’. A good guide can offer a lot of local information not available in ‘Lonely Planet’, will inform you on the relevant sites - and the local economy is being supported. Of course I have a reluctance like most budget travellers to part with my money, but in cases like this I generally feel it well spent. Even as darkness fell, Abdramane felt bound to give me the full tour (even though we’d agreed a cut rate as it was late when we started), and we ended up walking the narrow alley ways by the light of his mobile phone, with tantalising glimpses of family life and dinner preparations going on through open mud doorways. Any light was yellow – from fire. This was more enjoyable to me than impressively carved Moroccan doorways and mud built mansions. Atmospheric was an understatement. Interesting how light, or lack of, alters the perception and reaction of the experience. While getting ready to photograph the impressive structure of the mosque from a nearby rooftop in the late afternoon, my camera battery ran out! But that turned out to be for the better. The next morning, we returned, this time my guide asking was I interested in seeing inside the mosque. My French wasn’t great and I thought I misunderstood him. Any guide book I’d read had warned it was prohibited for non Muslims to enter the great mosque. So it was with a certain excitement at the prospect of tasting the forbidden fruit I agreed when he confirmed the offer. It turned out he knew the son of the muezzin, or person who calls the town to prayer, and we could slip in the back door for a brief visit. After some negotiation over a ‘contribution to the upkeep of the mosque’, I was ushered in to the sacred space. It was impressively large in scale about the size of a football pitch. Inside, all that could be seen were a forest of mud pillars, one hundred and twelve of them supporting the roof of the structure. 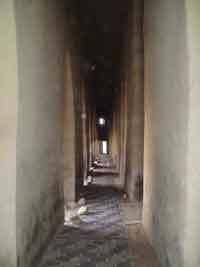 It was gloomy, the only light from small openings at the end of the rows of pillars. At the front was a small alcove, where the immam would stand. And that was it. The floor was sand, with mats. As with Islamic practice there was no adornment on the walls, the whole effect was of simplicity and stillness. It was this that made the impact so powerful. After ten minutes I was signalled out. My time was up. 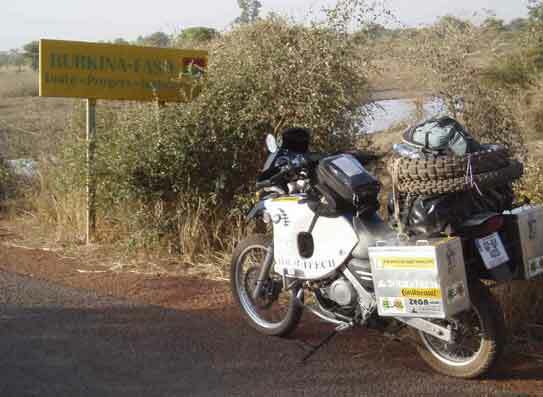 I was heading next for Burkina Faso, and camped that evening in No Mans Land after the Mali border formalities. My usual practice was to wait until near dusk, select a suitablle spot – accessible by bike, adequate bush or tree cover, and if possible not near any village. Making sure I wasn’t spotted by anyone, I’d head off a few hundred yards from the road, and pitch my tent so as not to be seen from the road. Of course invariably I would be discovered sooner or later, even in desolate Mauritania where there wasn’t a sign of life for miles on end, up would pop a local to investigate this strange arrival in his patch. This time a young farm labourer with mattock slung over his shoulder was on his way home. He paused with surprise, and stayed to watch with curiosity as I unpacked, then erected my tent, rushing over to clear the ground with his implement before retiring again at a distance, shyly. As is usually the case in these situations, he didn’t have any French, so communication was by gesture and facial expression. I have never to date been asked for anything, and it is in times like this it is such a pleasure to be able to offer something – whether a pencil, sticker, or excess food. On this occasion I took the opportunity to offload some of my excess clothes. When all had been done, he’d seen me prepare some food on the stove, and was about to eat, he waved and slipped off. I have a lovely memory that Saturday evening of sitting back after a cup of coffee, gazing at the African night sky and listening to the sounds of the bush. It had been a while. On a particularly nasty stretch of road in Mali with absolutely no sign of habitation for miles, I paused for a breather, and to check my load. Less than two minutes later, this man arrived behind me on his bicycle with the pump thinking I was in trouble. 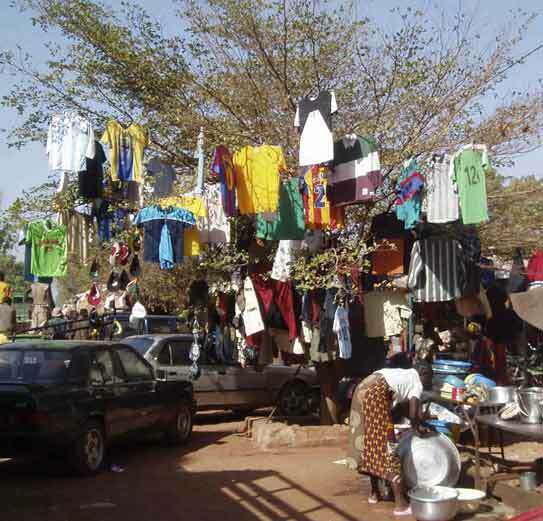 The following ten days were spent in Bobo–Dioulasso, a town the Rough Guide describes as having “…style and a great atmosphere. Sweeping avenues roofed by the foliage of cool mango trees, colonial buildings in the style soudanais and a rich texture of people give it a unique character that make it one of the most inviting places to unwind anywhere in West Africa. It’s also a traditional music centre, with balafon orchestras and electric bands adding night-time action to the town’s many bars.” Who could pass up that invitation! I needed to catch up on quite a number of things, and this sounded like the place to do it. Casa Africa is a hostel in a compound in Bobo recommended to me by a Ian and Jackie from Newcastle and Holland respectively, who I’d met in Djenné. They were intending on taking a similar route to me down to South Africa and had sold up everything they owned. Their Land Rover was certainly impressively equipped. 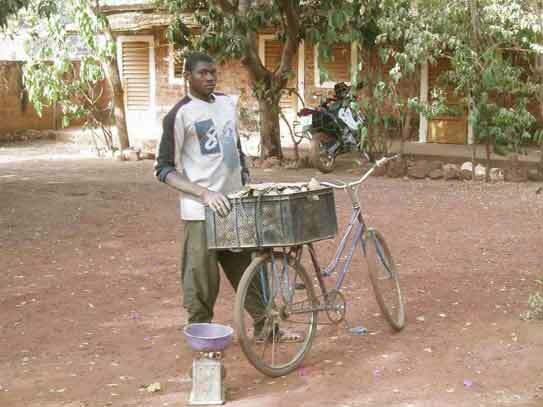 (A few weeks later they emailed to say they were delayed in Ouagadouga, Ian recovering from pneumonia and malaria.). Outside of the centre of town, it was quiet and attractively laid out, with a courtyard shaded by mango and bouganville trees… oh, and had the best cook in west Africa. Ardiouma the proprietor, who had taken over from the original French owners, had been trained by them in the kitchen, and dished up the tastiest steak au poivre with frites this side of Marseilles. Quite a selection of travellers passed through while I was there. Thierry, well established when I arrived and still there when I left ten days later, had a fondness for the local beer, usually starting daily about mid morning . He went through three ‘girlfriends’ while I was there, getting lucky I think with the third, a lovely girl, as he was well ensconced with her when I left. 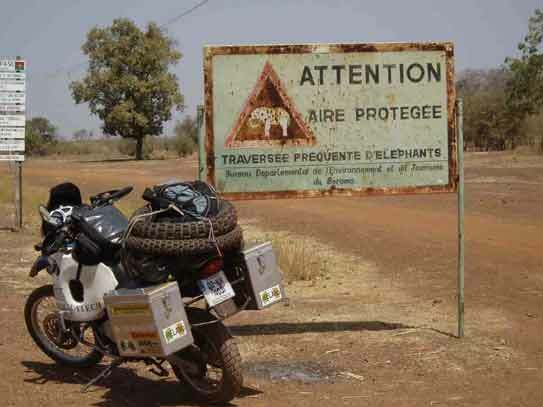 Pascal the Alsatien was cycling through Africa. blog At the age of 44, he worked at anything he could back in France saving for his next trip. He’d already cycled through Asia and South America. Just the practical difficulties of getting enough water seemed insurmountable. Some of his tales, like once having to gulp down dirty well water in desperation, and puking it back ten minutes later, were told matter of factly, and as for cycling against a headwind for two months through Mauritania and Senegal… He is a braver man than me. Of course he related it all with good humour and energy. He was someone who was getting a lot out of the comforts of Casa Africa. Erin was travelling through West Africa on her own with public transport, on her way to visit a friend in Abidjan, the capital of war ravaged Cote d’Ivoire. An epidemiologist, she had spent seven years working on Aids prevention projects in east Africa, the last three in Rwanda. It was fascinating to hear of the progress they are making with the International Aids Vaccine Initiative (www.iavi.org). And dreadlocked Carole from Finisterre in Brittany, who it couldn’t be denied looked Irish, had left her travel companions up the road in the capital Ouaga, and was spending time here. She had found out there was an aid project in Burkina that was coordinated from near her home town, and had been offered some space in a container being shipped back there. She was using the opportunity buy various handicrafts, mainly beads and wooden jewelry to sell back in France. Carole had an interest in, and ability with language. 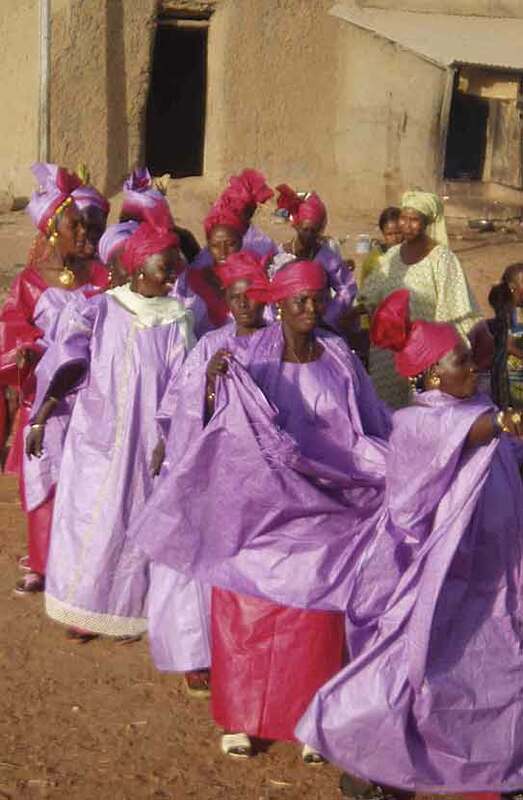 Having spent time in Bamako learning Bambara, she was now picking up the local language Dioula. She also was adept at sign language, and what impressed was the energy she spent nearly every day, visiting a local deaf and dumb school to communicate with them. Olivier, another Frenchman in his forties, rolled into the compound one day in his Ford Transit, dog in tow, a large mutt. He had a ‘clothing retail business’ in the summer in his native town of La Rochelle, selling I understand ethnic type clothing to the holidaymakers. The techno music he had thumping out of his stereo didn’t initially attract me to his company. However there was more to him than met the eye. He made me my first cup of real coffee since Morocco. Olivier was travelling to Ghana to meet his girfriend, just finishing a stint working for an NGO in the Congo, and were hoping to continue on to Sierra Leone. He had been friendly with an elderly ex pat who had a diamond mine there until the present trouble, and who wanted to return. 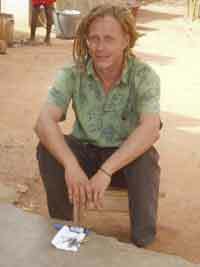 Olivier was attracted by stories of beautiful scenery, lovely people and some of the best beaches in West Africa. His idea was to open a resort or hostel, that would be attractive to holidaying aid workers on a break from projects in west and central Africa. Another little surprise was that he had sailed the Atlantic twice! An image I have in my mind (which will have to stay there as I was too late with the camera) was early one morning passing the van with the rear door open. There under the mosquito net was Olivier asleep on his back, the big hound next to him also on his back, four legs in the air. Frank, the mild mannered Dutchman who conversed easily in French, German or English drove into the compound in his Opel Vectra. He was an old Africa hand, having spent twenty years driving vehicles from Europe to sell variously in Mauritania, Mali and Burkina. I had noticed this phenomenon earlier on my trip, and was wondering about the practicalities of it. No longer worth it, maintained Frank. The market was getting too flooded. He had got out of the game a few years back, and was now travelling a few times a year to source artifacts for European antique collectors. I didn’t find out if that meant exporting indigineous works of art out of the countries (though he maintained there is no art in Africa – everything made has a use, jewellry, masks, all have a function). And of course there was Stefan who had motored down from Germany – on his 50 cc mobylette. When I arrived, he had already been there three weeks, and was still talking about leaving when I left. We discovered fairly quickly that we had something in common – Stefan had lived in Kilkenny for a couple of years. It was very strange to hear familiar landmarks and names trotted out. After a week there, conversation among a group of us came around to older people travelling. I mentioned a mother of a previous girlfriend who, at a fairly senior age, after mourning the passing of her husband, upped and left for Indonesia with a backpack and a one way plane ticket. Stefan not only knew who I was talking about, but claimed to have gone out out with one of her daughters! We had in fact gone out with two sisters. I discovered Bobo indeed does have a lot to detain you. Food, never far from the top of my list of interests, was for the first time on my trip something to look forward to. If it wasn’t Adiouma’s cuisine, including a delicious beef filet brochette for a couple of euro, or grilled fresh capitaine – a locally caught, fleshy freshwater fish – in a local restaurant, there was always the supermarket to drool over, my first in Africa. Filled with imported French fare, I visited it on my first day to be faced with such delicacies as Cote d’Or chocolate, beakfast cereals, ground coffee, and French cheeses. It was also the first time on the trip I had got the ‘runs’, so came out with a packet of digestive biscuits! The previous day I’d eaten from a roadside stall in Mali the ubiquitous riz gras, basically rice with sauce. Eaten with the fingers scooping up a mix of it and shoving it, in my case clumsily into your mouth, I found it quite tasty. Unfortunately, though I notice pots, pans and plates are scrubbed thoroughly, it always seemes to be in the same bucket of water which often gets very murky. So whatever got to my stomach I think it was from the water, rather than the food. Bobo also had a reputation for good live music. Central to Burkina music was the balafon and djembe – a large wooden xylofone and drum played between the knees. A performance I was brought to outside a bar on the outskirts of town was terrific. The sound from five or six djembes and two balafons was surprisingly full and of course rhythmic. One of the balafon players, known simply as ‘Vieux’ (though he was in his twenties), was obviously the star player and as the evening wore on, he seemed to become possessed to where the ‘orquestre’, playing at such an intensity, and Vieux with some jazz brilliance, seemed to levitate. With the pounding rhythm of the djembes and constant melody of the second balafon, he would hold back a half beat, then throw his body into a rattling, breathtakingly rapid riff. He was on fire. In my enthusiasm I proferred the equivalent of a three euro note to my companion to give to Vieux, following the local custom. He insisted, along with others, that I would have to do it, so the only white boy in the audience self consciously steps forward and slaps the note onto the sweaty forehead of the balafon player – to an appreciateive grin from him and shouts of approval from the audience. I wasn’t allowed take my seat and had to dance in front of the stage, not difficult as the music was so intoxicating. A great evening. At another club, the ‘Le Bois d’Ebene” (The Ebony Wood), the ‘directeur artisque’ Salia-Jimi, a very likable, slight figure in his fifties who played guitar in an Afrobeat combo I watched one evening, turned me onto the sound of the Flute de Fouta – played with expressive utterings on the breath coming throught the flute – and the very tasty keyboard of Seck Tidiane Check from Senegal, and the album ‘Zenophobie’. It was a very difficult lifestyle to break away from. Days settled into a pattern of fairly early rising – it didn’t take long for the heat of the day to set in – and after a leaisurely breakfast of granola bought from the supermarket, I would try and spend a few hours catching up on the laptop, or doing a few things with the bike or just the general chores that got neglected while constantly on the move. Washing clothes wasn’t one of them. It cost very little to get a local woman to do it. This met with predictable disapprobation by one or two of the visiting Europeans – tut tutting that I wouldn’t do it myself. In the Himalayas I remember as well the issue of whether hikers should carry their own packs and not visit the indignity upon the locals. My belief was, far from being an indignity, the local porters would be very happy to earn the income – it was their livelihood. It also meant I could enjoy the walk better. Temparatures were climbing towards 40 degrees, the time came when I was ready to leave, and with difficulty, I tore myself away from the comforts of Casa Africa and Bobo. It was a straightforward tarmacadamed road to the capital Ouagadougou. Twenty kms before the city, paused at a shaded spot off the road sorting out a fuel supply problem, I heard a bike stopping and noticed two helmets over the wall – had to be Westerners. Indeed it was. 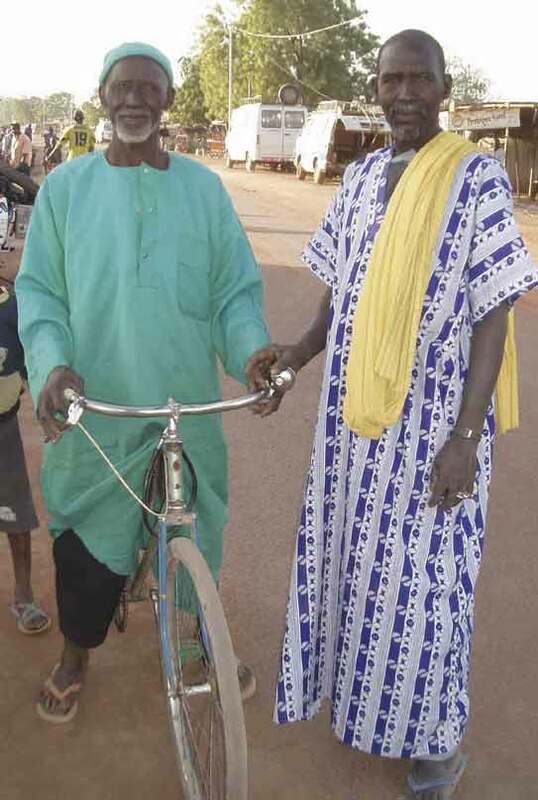 What a coincidence – the first bikers I’d seen in Burkina, and only the second since Nouadhibou in Mauritania, Zbr… (heavily accented Czech name which I can’t remember) and his wife just happened to pull over into the same hidden enclosure as me, at the same time! 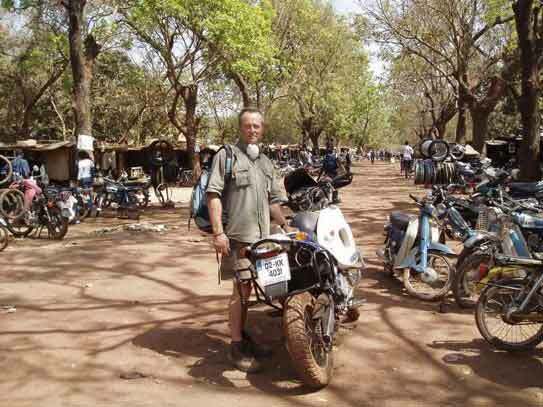 He edited a bike magazine in his country, had been working as support in the recently finished Dakar Rally and they were now doing a brief tour of Burkina. The rally was supposed to go via Timbuktu but had been cancelled. Apparently there had been a Tuareg raid on an outlying police station, arms had been stolen and not recovered since so there was nervousness among the organisers about that. My Czech friend had heard that story, but believed it was more a case of a bit too much difficulty with logistics of organising that leg, and they decided to spin that story. His highlight was watching a 65 yr old Englishman compete, who had managed to complete half of the two week endurance race which is notoriously hard on competitors. He was full of admiration. The two of them (and they were both well built) were on a Czech bike, a Jawa, which in fact had the same Rotax 650cc engine as mine, though much cheaper! 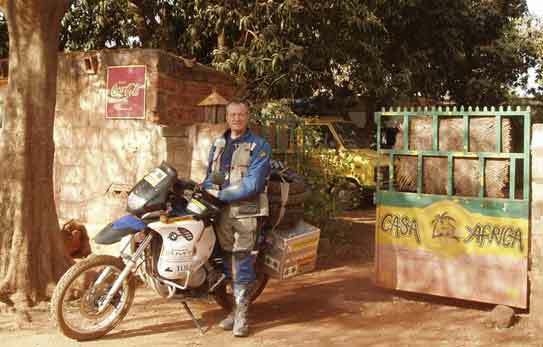 He had nothing but praise for the BMW F650, having ridden one around West Africa the previous year after the same rally - 18,000 kms without one problem. This of course was all very reassuring to me. During the music festival in the desert near Timbuktu, I had disbeliievingly spotted a fellow Kilkenny man in the audience. I knew him to be probably the town’s keenest music fan – but this was a bit much! I slipped up behind him. “Don’t think they’d fit all of that band onto Cleere’s stage,” I casually commented. Cool as a cucumber, John Sheehy replied, ” Probably get them into the Watergate though.” We both had a great laugh at the improbability of meeting up there. 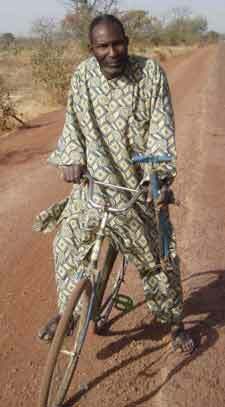 When I explained my circumstances John declared he always loved the idea of getting a card from Ouagadougou. 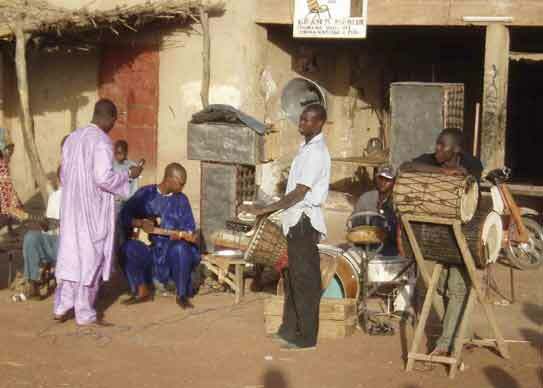 So after an overnight stop there, during which I caught a great band called ‘Baobab Sacré’ – two kora, bass guitar, flute, drums, balefon and great trumpet – I made my way to the post office to send John his card before getting on my way. The temperature was on the uncomfortable side of warm – I later learnt it was 43 degrees. It felt like riding in a fan oven. I was heading for the border with the Benin Republic and across to Nigeria. In Barnaby’s orphanage, I photographed this child hauling a bucket of water over from the well. It was for the children going to school, who all washed themselves before leaving.